MINNEAPOLIS & REHOVOT, Israel--(BUSINESS WIRE)-- SOLIDWORKS World 2017 — Stratasys Ltd. (Nasdaq:SSYS), the 3D printing and additive manufacturing solutions company, today unveiled the new professional, versatile and fast FDM-based F123 Series (F170, F270 and F370) for smarter prototyping, designed to make professional rapid prototyping more productive for design workgroups. The Stratasys F123 Series empowers virtually any user, regardless of 3D printing experience, to build durable and accurate prototypes using a range of functional FDM 3D printing materials. 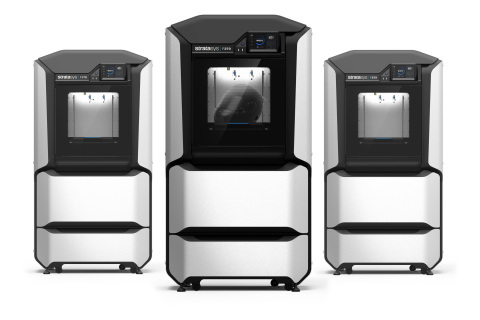 A single Stratasys F123 Series 3D Printer addresses the complete prototyping workflow, from initial concept verification to design validation and final functional performance, to ensure product designs are thoroughly evaluated and endorsed before manufacturing - resulting in better products and shorter lead times. Design workgroups play a dominant role in product design and development in consumer products, aerospace, automotive and other key industries. According to recent Stratasys surveys, accessibility, ease of use and material choice are among the top priorities in the wider adoption of 3D printing for rapid prototyping in workgroups. The F123 Series addresses these and other rapid prototyping requirements to potentially accelerate the adoption of 3D printing for product design and development. "It's pretty powerful having this much capability in a single system that sits right in our work space. We've tried lower-end 3D printers in the past, and to be honest, they're dimensionally inaccurate. The Stratasys F370 matches the CAD input every time with accurate, high quality prototypes," said Jesse Hahne, Partner, Center for Advanced Design. "The key for us to fast-track product development is getting physical samples in front of our customers as soon as possible. With our new Stratasys F370, we're able to get brand new iterations in a matter of hours. This rapid prototyping solution has truly become a member of our team." The exterior design for the Stratasys F123 Series was created together with leading industrial design firm Designworks, a BMW Group Company. Most operations are easily performed using a touch screen user interface. Stratasys F123 Series can be operated remotely from any networked computer in a shared workgroup setting and build progress can be monitored from portable devices. Installing and replacing material is equally fast and easy. "Our inspiration for the design of the Stratasys F123 Series was advanced robotics. Just as robotic tools of the future will adapt to their envisioned usage environment, we worked with Stratasys to create a look, feel and ergonomic design for the F123 Series that would offer expertly crafted user interactions," said Andre de Salis, Creative Director, Designworks. "The Stratasys F123's striking metal cladding expresses the performance, durability and refinement of the 3D printer to bring a new level of excitement and accessibility to professional 3D printing." "Today there is a vast market opportunity in product prototyping that we feel is not being addressed by current 3D printing systems. The launch of the Stratasys F123 Series targets these product design workgroups, industrial designers, engineers, students and educators who demand a professional quality rapid prototyping solution that's simple to use, produces reliable, engineering-quality results, integrates perfectly within an office or lab setting, and is affordable to own and operate," said Zehavit Reisin, Vice President, Head of Rapid Prototyping Solutions, Stratasys. "As the company that invented FDM, Stratasys brings a rich pedigree to the F123 Series, providing our customers an optimal balance between usability and high performance." A long-time member of the SOLIDWORKS Partner Program, Stratasys is also announcing a GrabCAD Print Add-In for SOLIDWORKS. It enables the user to estimate and 3D print parts for a range of Stratasys systems, including the F123 Series without leaving the SOLIDWORKS environment, giving 3D printer access to the entire community of SOLIDWORKS design and engineering professionals. To witness the power of the Stratasys F123 Series and the new GrabCAD Print Add-In for SOLIDWORKS first-hand, please visit Stratasys at SOLIDWORKS World 2017 in Los Angeles, CA at Booth #701. The Stratasys F123 Series is available in three models with build sizes ranging from 10 to 14 inch (25.4 cm to 35.56 cm). The Stratasys F123 Series accepts up to four material types in 10 colors to support a wide range of prototyping and tooling applications. For example, the F123's new Fast Draft Mode leverages PLA material to quickly produce conceptual prototypes at a low cost per part. Production-grade ASA and ABS are ideal for producing strong, stable, repeatable parts and for even stronger, impact-resistant parts there is engineering-grade PC-ABS. Enhanced user experience dominates the Stratasys F123 Series design, with no special 3D printing expertise required to achieve professional results. Fueled by Stratasys Insight software, almost any CAD file can be utilized while Stratasys' GrabCAD Print eliminates time wasted on file conversion and STL preparation. The Stratasys F123 Series employs 15 new Stratasys patents in its design. For more than 25 years, Stratasys Ltd. (NASDAQ:SSYS) has been a defining force and dominant player in 3D printing and additive manufacturing - shaping the way things are made. Headquartered in Minneapolis, Minnesota and Rehovot, Israel, the company empowers customers across a broad range of vertical markets by enabling new paradigms for design and manufacturing. The company's solutions provide customers with unmatched design freedom and manufacturing flexibility - reducing time-to-market and lowering development costs, while improving designs and communications. Stratasys subsidiaries include MakerBot and Solidscape, and the Stratasys ecosystem includes 3D printers for prototyping and production; a wide range of 3D printing materials; parts on-demand via Stratasys Direct Manufacturing; strategic consulting and professional services; the GrabCAD platform with over 3 million professional users; and the Thingiverse and GrabCAD communities with over 2 million 3D printable files for free designs. With more than 2,700 employees and 1,200 granted or pending additive manufacturing patents, Stratasys has received more than 30 technology and leadership awards. Visit us online at: www.stratasys.com or http://blog.stratasys.com/, and follow us on LinkedIn. Stratasys, Stratasys signet, ABS-M30, GrabCAD Print, and Stratasys F170, Stratasys F270, Stratasys F370 are trademarks or registered trademarks of Stratasys Ltd. and/or its subsidiaries or affiliates and may be registered in certain jurisdictions. All other trademarks belong to their respective owners. The statements in this press release relating to Stratasys' beliefs regarding the benefits users will experience from the F123 are forward-looking statements reflecting management's current expectations and beliefs. These forward-looking statements are based on current information that is, by its nature, subject to rapid and even abrupt change. Due to risks and uncertainties associated with Stratasys' business, actual results could differ materially from those projected or implied by these forward-looking statements. These risks and uncertainties include, but are not limited to: the risk that users will not perceive the benefits of the F123 to be the same as Stratasys does and other risk factors set forth under the caption "Risk Factors" in Stratasys' most recent Annual Report on Form 20-F, filed with the Securities and Exchange Commission (SEC) on March 21, 2016. Stratasys is under no obligation (and expressly disclaims any obligation) to update or alter its forward-looking statements, whether as a result of new information, future events or otherwise, except as otherwise required by the rules and regulations of the SEC.